Soothe away the pressures and strains of daily living with the ancient healing art of massage and body treatments. These treatments also make excellent gifts that can be enjoyed anytime of the year. All of our massage staff are registered for extended health care benefits. Direct billing is available for Blue Cross, Great-West Life, Sun Life, and Manulife clients. 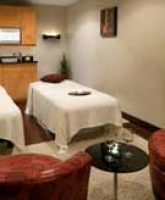 Also with all spa services (including massage) enjoy complementary use of the pool and whirlpool at the Halifax spa and sauna (women) or steam (men) at the Dartmouth spa. Bathrobes, sandals, and towels will be provided. People who experience headaches, motor vehicle accidents, or sport/work site injuries, often have jaw issues that can accumulate to overwhelming levels of discomfort. This treatment relieves the pain that is found in the jaw to these, or various other cases. Clenching the teeth is a very common habit during sleep, while concentrating or from stress. This often results in an accumulation of both compressive forces in the joints and asymmetrical muscle tightness which can lead to clicking, pain and ultimately joint damage. Do you have a massage or body treament booked? Take a few minutes to complete our secure online consultation form to save time once you arrive.